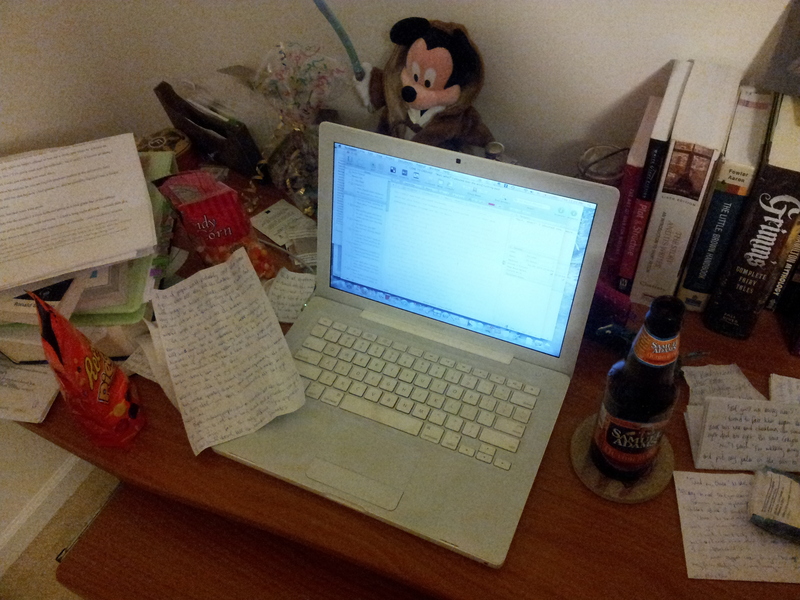 It’s rewrites and beer o’clock! ICYMI, Harper Voyager (the specfic branch of big-sixer Harper Collins) is throwing wide its submission doors for two weeks in October to unagented, unsolicited FULL manuscripts. HV publishes bigwigs like Richard Kadrey, Gregory Maguire, Kim Harrison, Clive Barker, Jack McDevitt, CJ Cherryh, S.M. Stirling, Cory Doctorow, Christopher Moore… seriously, it’s ridiculous. So I’ve got this manuscript I queried a few months ago–an agent even asked me for pages–but it was ultimately rejected (or ignored) by everyone. I was not disheartened, of course, because you can’t be, and started querying a new thing. But this manuscript, I think, featuring characters that have been swimming in my head for more than two years now, is a good one. And hell, I’m just pompous enough to want to see this thing in print. But then, what is an aspiring author if not just pompous enough to want to see this thing in print? Anyway, the manuscript: something like 93,000 words and finished. Done. Had a couple rounds of revision, a handful of beta readers and yes: done. Good. Queried. Great. Rejected. Whatever. And two months later, I pick it up again and go, well, this thing needs to be fixed before I send it off to… ye gods, I queried this? You bastards let me query THIS?! So I started fixing things. And tinkering. And rewriting. And rewriting and rewriting and rewriting. Whole scenes. The opening sequence, which I’d already written like five times, which had to include what the MC is and what she’s capable of. The introduction of the villain and the fear-factor of him/it/them. And in the course of said rewrites, I’ve realized that it’s changing things. I’m remembering other things, in other parts of the manuscript, that should probably be touched up. And you know what? This is great. I wrote the first draft of this manuscript almost two years ago, and it’s been back and forth with revisions ever since. It’s been at least two months, if not three, since the last time I even looked at this damn thing, and, well… damn. Best part? THE DEADLINE. Harper Voyager’s open submission period closes October 14. I have–checks calculator–another 80,000 words to revise (and hopefully not rewrite) in the next three and a half weeks. Excuse me while I scuttle back, Gollum-like, to the writing cave. This entry was posted in Writing and tagged amwriting, christopher moore, cj cherryh, clive barker, cory doctorow, editing, gregory maguire, harper voyager, jack mcdevitt, kim harrison, october, open submission, querying, revising, revision, richard kadrey, s.m. stirling, self editing, unagented manuscripts, unsolicited manuscripts, writing. Bookmark the permalink. 2 Responses to It’s rewrites and beer o’clock! Good Luck! I’m sure the rewrite will be super awesome. But seriously, good luck. I know you can get through it!